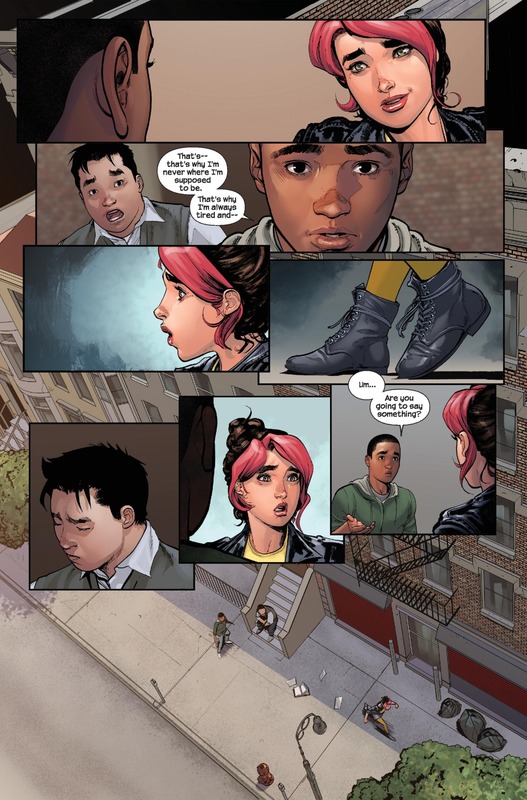 Miles Morales decides to reveal his secret to his girlfriend, and the hunt is on for the newly escaped Green Goblin. 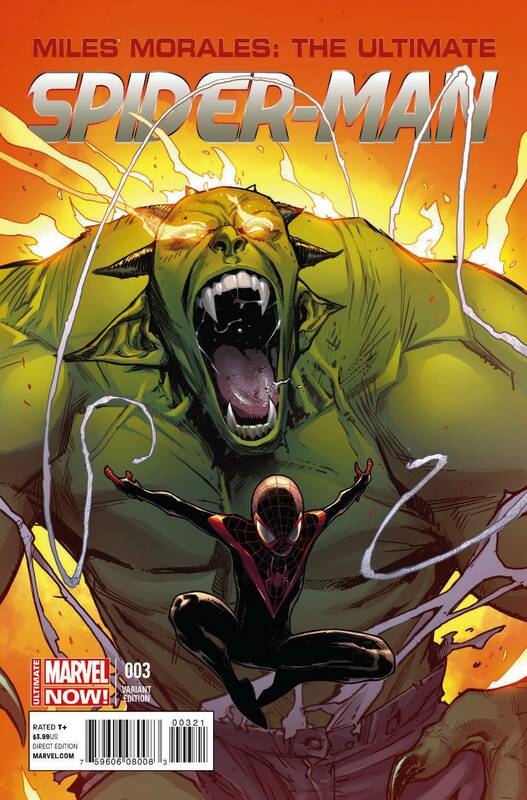 Judging from the cover art, it seems like we will finally be able to see a fight involving the Ultimate Spider-Man…but you would be wrong, again. This issue is mostly just talking, with a page or two of the Green Goblin attacking S.H.I.E.L.D agents. When will we finally see Spider-Man in action?! Miles decides that it’s a good idea to tell his girlfriend that he is Spider-Man, and right when he tells her, she runs away without saying a word to him. 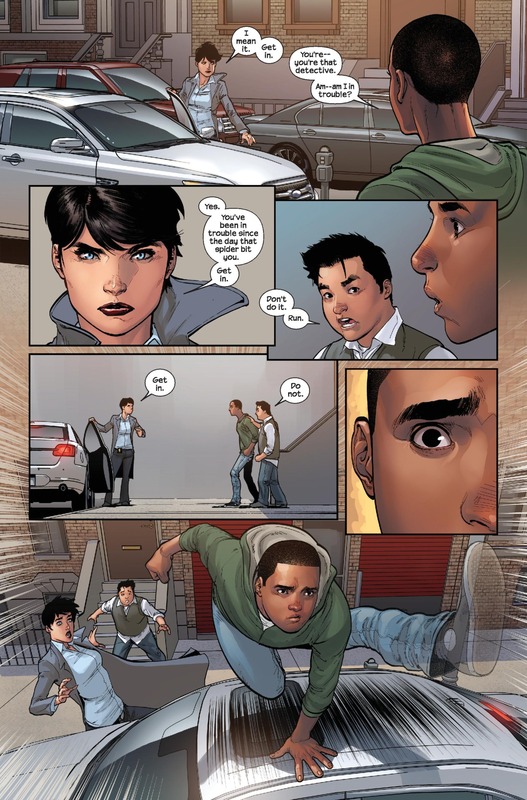 Agent Maria Hill, who is now covering the investigation of the two “Spider-Men” burglars, finds Miles and asks him to come with her for questioning about the burglars and his parents. After hearing that the Green Goblin has escaped prison, Miles races to Aunt May’s house to make sure she is safe. Miles confronts the Green Goblin, and right when you think the epic fight we were all waiting for was going to happen, the issue ends and we have to wait another couple weeks to see the fight. Why must the cover art lie to us? Besides this very anti-climactic issue, I really am a fan of the art style by Marquez. Even though the comic isn’t exciting to read, at least it’s nice to look at. The story line is interesting, with Peter Parker and Green Goblin back to life and all, but having three straight issues without ANY Spider-Man action really doesn’t make this a Spider-Man comic, it’s just getting boring. Maybe in the next issue the fight with Spider-Man and Green Goblin will save the series—if it even happens. -3 issues in and we still have yet to see a legit Spider-Man fight.